Every year, the Charities Aid Foundation (CAF) produces a World Giving Index report to provide a clear view of how people give around the world. They rank countries based on the average percentage of people living there who donate money, volunteer their time, or assist strangers. The point here is that, for all the philanthropic work accomplished in the U.S., there are other international markets performing at, or near, similar levels of efficacy. For any nonprofit, being able to enter these markets and seamlessly begin fundraising can usher in a new era of success. Room to Read is one such organization that’s been fundraising internationally for years. To increase the scope of their global impact, the organization seized an opportunity to partner with Classy and collaborate on Classy Passport. The newest product offering from Classy, Classy Passport is for anybody who wants to grow their fundraising beyond their backyard. It doesn’t matter if they’re already established in international markets, or they’re looking to expand beyond their local community for the first time. Dr. Geetha Murali, Chief Development and Communications Officer at Room to Read, sat down with us to discuss the landscape of Room to Read’s international fundraising efforts and how Classy Passport helped them bring everything together. When Room to Read first began, the organization’s founders turned to domestic sources of fundraising to fuel their programs. Eventually, they began growing into international networks to find like minded individuals around the world who supported their mission. During the organization’s adolescent years, it accrued a lot of support out of Asian markets like Hong Kong and Singapore. In fact, Room to Read was one of the first NGOs to start hosting events and fundraising in those countries. To date, Room to Read’s commitment to growth in the international fundraising realm has helped them expand across Europe and Asia Pacific (APAC), with a significant presence in Australia as well. The only thing standing in the way of ultimate success was a fundraising solution that allowed Room to Read to truly unite all campaigns, networks, and individuals by fundraising across multiple currencies. They needed to meet their donors where they were, no matter the country, culture, or currency. Using Classy Passport for their international fundraising ensured they could reduce these barriers to giving no matter where their work took them. Before they switched to Classy, Room to Read conducted an audit of their online fundraising software. 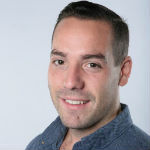 They identified some inefficiencies on both the front and back end of the various platforms they were using to raise funds across geographic markets. There were concerns around Room to Read’s aesthetic and brand not being unified across each online platform and therefore, each international market they were fundraising in. Maintaining a consistent brand is something they wanted to prioritize, but having to use a different software vendor in each market made this next to impossible. Working with different vendors affected more than just the appearance of their campaigns though. It also required Room to Read to have individual agreements with multiple vendors in order to get the fundraising data needed to validate and inform their development and communications strategies. Not only that, it made the import, export, and reconciliation of their data across campaigns cumbersome. And while it was inefficient, Room to Read didn’t have much choice in the matter because there simply weren’t other options available. To find that platform, Room to Read investigated different product offerings in Europe, Asia, and the U.S. without much success. The problem remained: they couldn’t find one solution that provided unified access to fundraise in multiple currencies—and the data that comes with it—in all their markets. After all their analysis, Dr. Murali’s team came to her and said they would need at least two different products to accomplish all their goals. So, Room to Read came to Classy and together we created a solution that could fit their needs. Not only would this provide a unified brand aesthetic from campaign to campaign, the addition of Classy Passport would provide the ability to fundraise in multiple currencies within a single campaign. According to Dr. Murali, with Classy Passport, the entire Room to Read online fundraising ecosystem becomes scalable. The scalability of the Room to Read ecosystem, as one unified whole, is important because there are so many moving pieces that make the organization what it is. Namely, the diversity of their core base of supporters, which is comprised of high net worth individuals, and corporate and foundation supporters. For example, Credit Suisse works with Room to Read and has offices across London, New York, APAC, Hong Kong, and Singapore. With Classy Passport, each office can either host their own fundraising campaigns and accept donations in multiple currencies, or they can host one campaign across multiple offices in different countries. In addition to that, they have a widespread, active chapter network with small grassroots events happening around the world to build their brand and raise funds. A large portion of Room to Read’s growth comes from supporters engaging with chapters and at the grassroots level, telling their networks about the organization’s work. This is most evident in Room to Read’s Active for Education campaign. 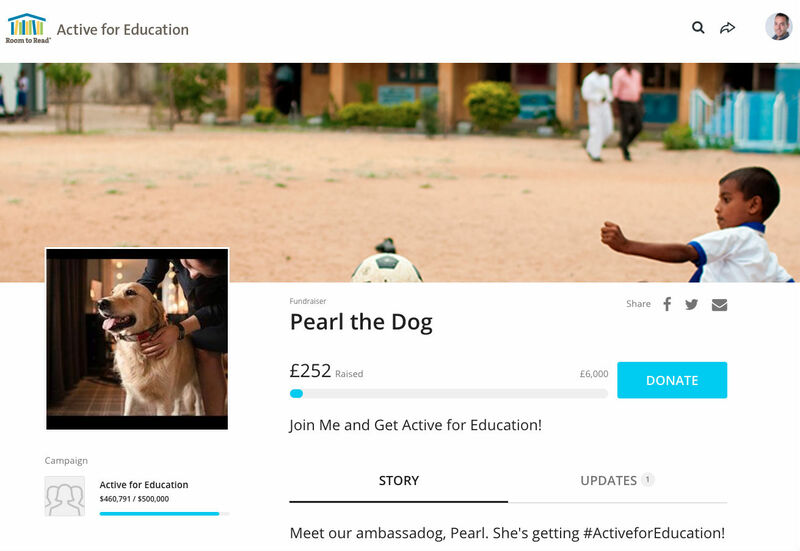 Through the Active for Education campaign, individuals can create a personal fundraising page in their preferred currency to support Room to Read’s work. 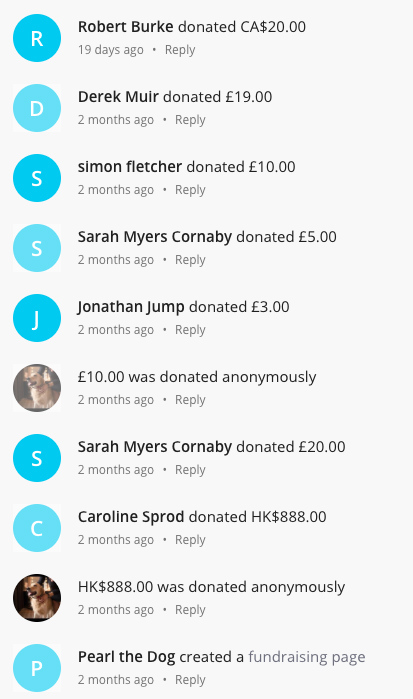 To date, Dr. Murali reports that there have been 150 Classy fundraising pages set up for this campaign with nearly 1,500 supporters donating to them. 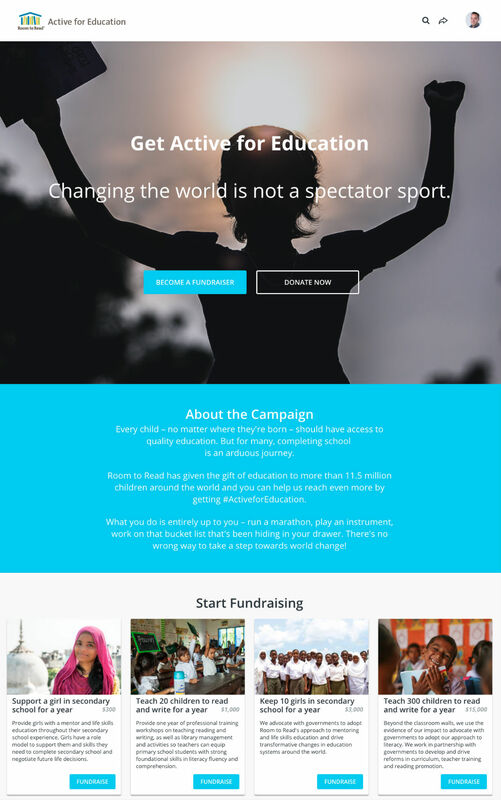 The Active for Education main campaign page where supporters can sign up to fundraise. One major group of supporters who host fundraising campaigns in one country, and collect support from all over the world, are Room to Read’s celebrity ambassadors. These are all under the banner of the Active for Education campaign, with consistent aesthetic and branding from page to page. 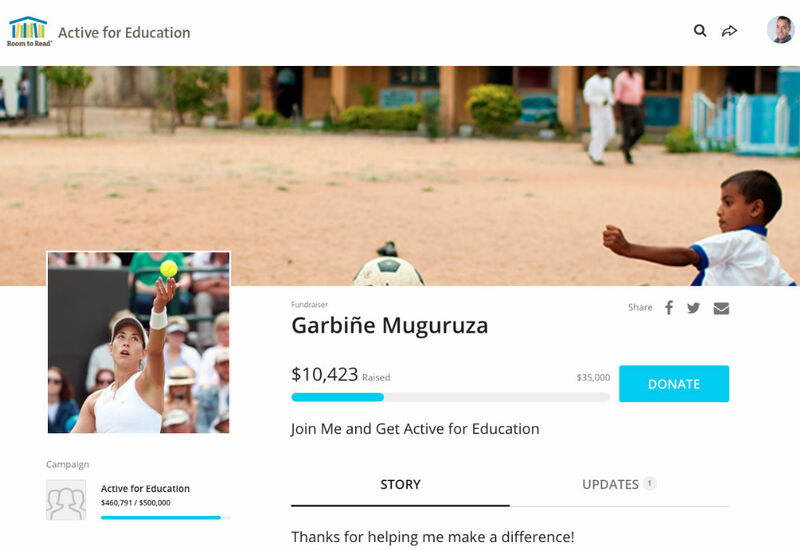 Wimbledon champion Garbiñe Muguruza—currently ranked second in the world for women’s tennis singles—created a personal fundraising page to support Room to Read. 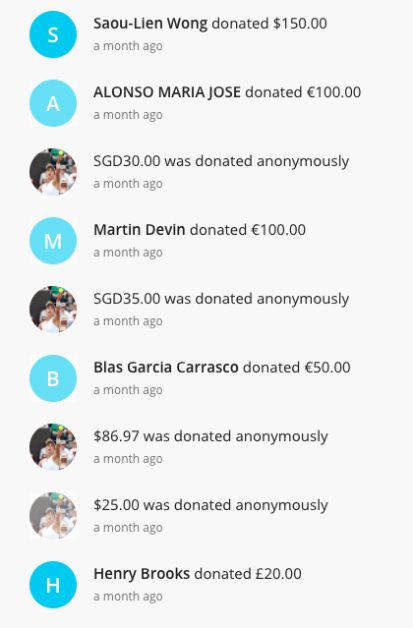 While the campaign’s main currency is set to U.S. dollars, Muguruza’s network of fans extends well beyond America’s borders. Notice how it’s also in line with the branding and aesthetic from all of Room to Read’s other Active for Education pages. This is what a unified front looks like for Room to Read, and this is what the power of Classy Passport helps them achieve. Even if your organization doesn’t have an international presence, a single campaign created with Classy Passport can now have a global reach based on the people who fundraise to support your mission. If you’re interested in learning how Classy Passport can help your organization unlock supporters around the world, talk to an expert here at Classy today.